When I first came into office, I worked to make sure that our road and bridges funding centered on the priorities brought forth by the needs of our citizens. Working with our engineering division we worked to improve the processes and efficiencies to stretch our road dollars to the max. Below is a list of projects and improvements specific to District 2. Road and rail crossings for the Polson Industrial Park near Oakhurst. This industrial site created 100 jobs in 2015 and an anticipated 200 additional jobs by the end of 2016. After years of planning and incremental work on the Gilcrease Expressway, Tulsa County and the City of Tulsa are now included in the Turnpike Authority’s “Drive Forward” plan to build the bridge and a connection to I-44. 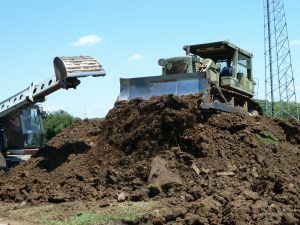 Secured Rural Economic Action Program (REAP) Grants to repair roads and replace signage in two unincorporated areas of Tulsa County. Working with Muscogee Creek Nation Transportation Division to place several Tulsa County roads on the Creek Nation inventory for future repairs and maintenance through cooperative agreements. Worked with the City of Tulsa and the Oklahoma Department of Transportation, to seek alternative routes and shorten the time span for work on the 23rd Street bridge. This was a critical step in supporting business and ensuring viable routes for commercial traffic along the 21st street corridor. A strong rural fire system has always been a priority for Tulsa County. Led by faithful and skilled firefighters, these rural fire departments keep families and properties safe. The Volunteer Keystone Fire Department continues to serve above and beyond under challenging circumstances during these past years of severe drought. Tulsa County Road Department personnel also work hand in hand with Keystone by employing county road apparatus to create fire lines. Working with the leadership of Berryhill Fire Department and with citizen input and a public vote, we extended the fire protection district to protect the Oakhurst community and lower their insurance rates. Construction is underway for the new Berryhill station on 41st street. County crews are currently moving dirt and building the road that will lead to this new facility. Many thanks to the hardworking crews from District 2 who are getting this project underway! Held numerous and ongoing clean up and recycling events in the Oakhurst community, Lake Station, Bruner Hills and Mayfair neighborhoods in Tulsa County. 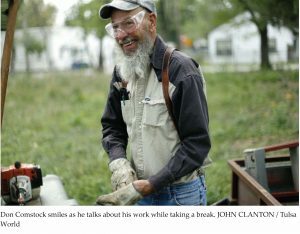 Click here to read the Tulsa World story about Don Comstock and his efforts to clean up his neighborhood. Worked with INCOG and the Tulsa Health Department to demolish dilapidated houses and structures in west Tulsa County. Worked with Tulsa County Parks leadership to develop a master plan for Chandler Park that will include campsites, hiking trails, expanded aquatic and play areas for our children. Identifying federal grant and private partnership opportunities to develop a compressed natural gas filling station for Tulsa County and public use. Led a successful public initiative to build a new Family Justice Center to effect substantive change in the lives of the juveniles and families we serve. Led efforts to fund and rehabilitate the Sand Springs/West Tulsa Levee system to improve safety while creating economic development and recreation uses. Passed a plan for infrastructure along the Arkansas River including low water dams and levee improvements through the Arkansas River Infrastructure Task Force. Serving on the VisitTulsa Advisory Council which focuses on presenting Tulsa as a destination city for conventions and high-quality events which generates tourism dollars via hotel/motel and sales tax dollars for our community. Strategic partner in Zero2016 helping to find housing for homeless veterans.